Sacred Heart Elementary School has been providing a quality education for inner-city children in the Lincoln Heights area of Los Angeles for 127 years! The continued ability to provide this education becomes more challenging each year and we rely on the support of our many friends and benefactors. 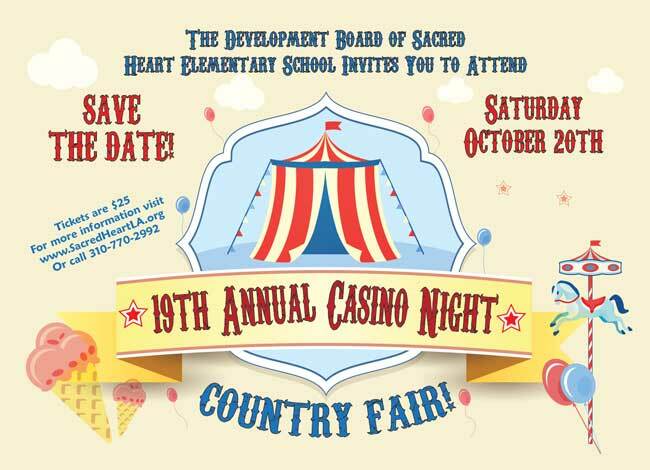 We invite you to support the students of Sacred Heart Elementary School by becoming a sponsor at our 19th Annual Casino Night A COUNTRY FAIR! on Saturday, October 20, 2018. It is hosted by the school’s Development Board who promise another fun-filled evening with proceeds funding academic programs, technology upgrades in the classrooms and financial assistance for families experiencing economic hardships. You can support our event by being a sponsor or by donating an item for our Silent Auction. Thank you!